A Belorussian man who had had his car scratched over 20 times in the last six months, finally managed to catch the perpetrator in the act after sleeping in the vehicle for a month. Finding your car scratched is unpleasant, but definitely not uncommon, which is why Kot Matroskin, a driver from Minsk, Belarus, didn’t pay much attention when it first happened to him, about six months ago. But after noticing subsequent scratches on the fender of his Volkswagen Polo, in a relatively short period of time, he started looking for clues about who might want to scratch his car and why. 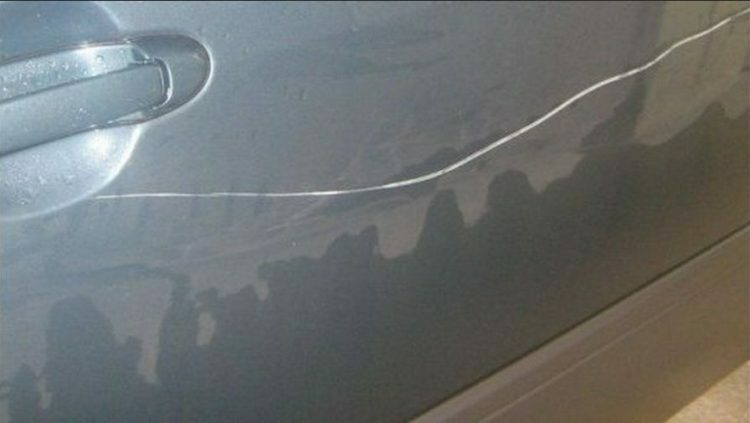 He was soon able to deduct that the scratching occurred only when he parked his car near a pedestrian walkway at the entrance of a park, and seemed to be done with the same object, as the scratches all looked very similar. In a story posted recently on automotive forum Scooter Club, Kot points out that he only parks in that particular spot when there aren’t any other places available near his apartment building, and always makes sure not to leave his car on the grass or block pedestrian traffic. But that didn’t seem to matter to whoever had it in for him, as new scratches kept showing up on his vehicle. He started thinking about people he might have had conflict with recently, but revenge didn’t seem likely, as scratching only occurred when he left his car near the park. Determined to get some answers, the man left a note in the window of his car asking the person who had made a habit of scratching his car why they were doing it. He even posted his email address, so the perpetrator could answer his question even if they feared a face-to-face confrontation. That didn’t work out as he had planned, as he got no messages, and the scratching continued. He then installed a camera on the dashboard of his car, hoping to catch the person in the act, but apart from some pedestrian passing suspiciously close to his car, the footage didn’t reveal anything useful. Matroskin realized that it was impossible to tell if someone was scratching the car as they passed by from the video, so he decided that he only had two options – find another place to park or catch this criminal himself. Matroskin admits that he is a very stubborn person, who refuses to accept defeat, plus the paint job of his car was already damaged, so he didn’t feel like he had anything to lose by trying to confront the serial scratcher. So for the last month, he got up in the middle of the night and went to sleep in his car, hoping to catch the perpetrator red-handed. After analyzing his daily schedule, he estimated that the scratching generally occurred between 4 to 6 in the morning, so he would set his alarm clock to 4 a.m. every night, put on thick clothes, grab a sleeping bag and spend three hours in the backseat of his car. To prevent condensation on the windows, which would give away his presence, Kot cracked open one of the rear windows. That sometimes left him exposed to freezing temperatures, but the thought of catching the serial scratcher made it all worth it. The Belorussian driver admits that this last month was tough. Having to spend several hours in a sleeping bag on the backseat of his car, unable to get any sleep, only to go home disappointed was hard to deal with. But luckily, his sacrifice was not in vain. On the morning of November 27, at 5:40 am, he heard someone pass by the car, followed by the characteristic long scraping sound of metal on metal. He quickly got out to confront his nemesis, but instead of the manly vandal he had imagined, he came face to face with a little old lady with white hair sticking out from under a funny hat. Kot filmed the whole confrontation with his phone, and even though at some point you can see the woman pleading with him, he writes that she actually feels no remorse for what she did, and is actually only complaining about being late to work. Matroskin adds that the woman only accepted responsibility for the scratches she left that morning, offering to pay him for the damage if he let her go without calling the police, but denying that she had scratched his car on other occasions. As for a reason why she scratched the man’s car, she couldn’t offer any. The driver eventually called the police and pressed charges against the woman, hoping to receive both compensation for both material and moral damages. “I just hope that after doing the authorities’ job of apprehending the offender, they can do theirs by properly punishing her for her crime,” Matroskin wrote.